1) Sell your crafts online. Selling your crafts on the World Wide Web is a great way to get your products out there for the world to see. Sure, you’ll have to deal with a lot more competition online, but the low overhead costs and the convenience of doing everything on the Internet may just make all the hard work worth it. 2) Sell craft kits or patterns. If you don’t have the time or the energy to sell completed crafts online, then why not sell project kits or patterns? You can sell sewing, embroidery or quilting patterns that are downloadable on the Internet. You can even try selling pre-made scrapbooks that just require people to add their own photos and final touches. 3) Become a direct seller of craft supplies. You don’t have to make your own supplies to sell them. There are a number of craft-related direct sales companies that are constantly on the lookout for consultants. Host a crafts party at home and introduce beginners to the world of crafting. Some of these companies you may want to look into are Touchstone Crystal, Close to My Heart and Stampin’ Up. 4) Write about your craft. If you’ve got a way with words, then why not earn some extra money by writing about your favorite hobby? 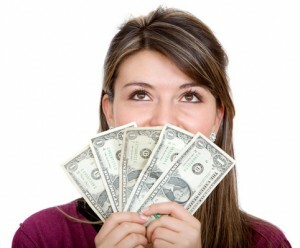 You can start your own blog (and learn to monetize it) or create how-to articles to submit in various revenue sharing programs such as About.com, HubPages.com, and Squidoo.com. Of course, you could also take in some freelance writing work for magazines and other publications that specialize in crafts. Nowadays, a large number of people are able to learn a new craft through magazine articles, books, and even online tutorials. The good news, however, is that many people still prefer to be taught by an actual person—at least to learn the basics. If teaching seems to be something you are interested in, you may want to look into offering classes at your local community center or at a local crafts or specialty shop. You can even offer to teach classes or sessions for events such as children’s birthday parties, or offer private sessions to interested individuals. Having Trouble Finding Patterns For Your Overweight Kids? For those who have plus size / overweight children it sometimes can become a nightmare trying to find nice styles that actually would FIT the child. Even the “plus” sizes don’t work because a 16 Plus would be for a somewhat overweight 16 year old, but what happens if the size range on that 16 Plus is what your child has, but he/she is only 8 or 9 years old? An 8 or 9 year old MAY be much larger in the waist, tummy and hip area, but are NOT the 16 Plus size when it comes to shoulders, arm length, dress or pants length, because your child is only 8 or 9 and NOT 16. As you can see, there is a BIG difference between the “average” size commercial pattern measurements and the Plus Size Children pattern measurements! We at PlusSizeChildren.com spent over 1 1/2 years accumulating the actual measurements of plus size / overweight / obese children from our readers, then put them into a data base so we could put together pattern sizes/ ages in order to make patterns that would fit those in the overweight/obese size ranges. What If Your 10 Year Old Has A 34″ Waist???? If you’re like most of us in the sewing business field, we tend to accumulate boxes and drawers full of fabric scraps. A few months ago I made up my mind that those scraps in the boxes and drawers were NOT making me any money, and decided to put my thinking cap on to see just how I could turn them into profit. 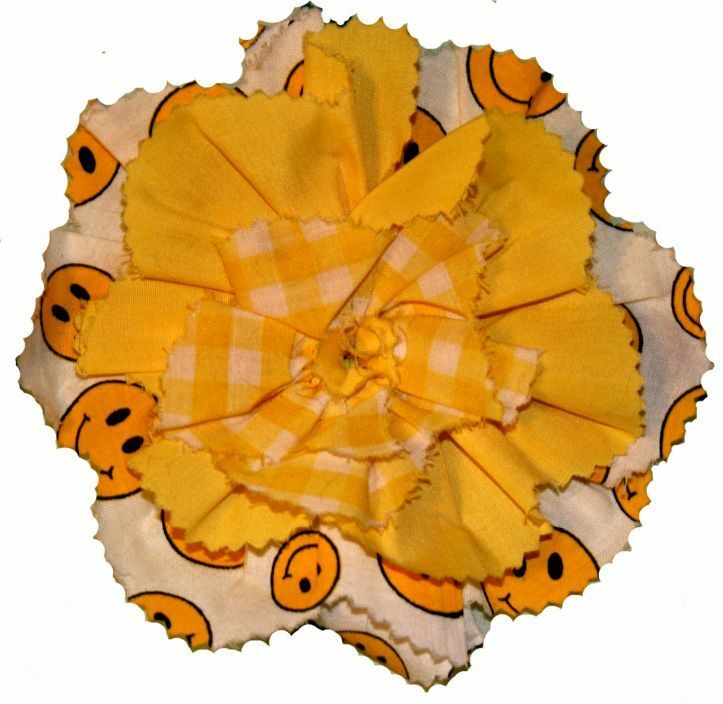 For our project of this month, I’m going to show you how I made flowers from scrap fabric, and how I then turned them into items that would indeed make some money. For each flower you’ll need co-ordinating color fabrics. Cut the first length 22″ long x 3″ wide. I’ve made a scallop edge along the outter edge, and cut the scallop and straight edges with a pinking shears. The second length of co-ordinating fabric will be 16″ x 2″. A third length can be made that would be 10″ x 1″. 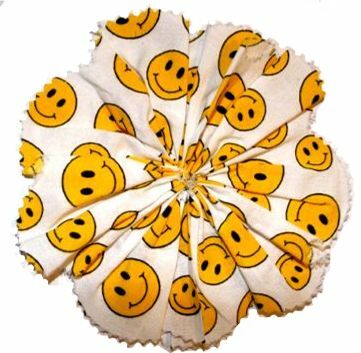 Sew a running/gathering stitch along the straight edge of the strips of fabric, then draw the thread up to make the flower shape. Gather the long edge until it makes a tight circle in the center and secure the middle with thread from the strip. Do the same with the smaller, co-ordinating color strips. 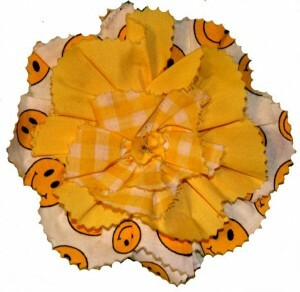 The last thing to do is cut a 1″ circle out of one of the fabrics to stitch to the center of the flowers. 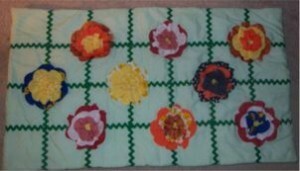 Use black thread to stitch the center circle to the flower layers. The first thing I did with one of the flowers was decorate a plain jean jumper for a granddaughter. This brought some orders for “decorating” children’s garments from the day care center the little girl attended. 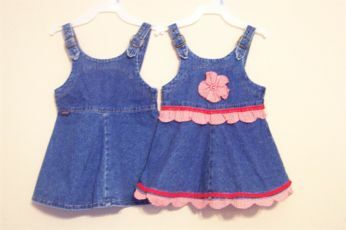 The jean jumper did turn out pretty nice, and I ended up making another one so I could hang one plain and one decorated in my customer area as a show and tell “before and after” picture. The next thing I did with some flowers was to make a couple bouquets to put in my customer area – and ended up doing some special orders for some customers. To make the bouquets, I put two flowers together with florist wire in the middle using hot glue to attach the three items. After making the number of double flowers/florist wire that I wanted, I added some greenery and stuck them in a vase. Now then, I’ve saved the VERY BEST idea for last! This one brainstorm has brought the most money from my scraps, and kept me busy last Christmas season. I made a doll quilt – finished measurements 19″ x 33″. Cut 2 pieces of cotton/polyester fabric 20″ x 34″. Using just one of the pieces, measure out and mark 6 lines down and 3 across, as in the following picture. Stitch wide rick rack along the lines, then attach assorted color flowers at several of the junctions where the rick rack crosses. Put the second piece of fabric on top and then a piece of quilt batting cut to size. Sew 1/2 inch seams around 3 sides, turn inside out, and hand stitch the fourth side closed. I had one of my granddaughters’ baby doll in a little doll bed in the customer area with the doll quilt on the doll — of course with a price tag on it. Little girls coming in with their mothers immediately ran to the little bed and wanted to have the “baby cover”. Grandmothers who came in for work fell in love with the little doll quilts and wanted some for Christmas gifts. There are many other things that can be done with the scraps — little tote bags, book marks, beach bags, bean bags and more. Let’s use up those fabric scraps and get a little extra cash coming in. 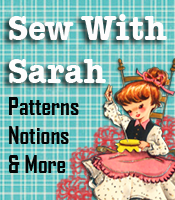 Check out Patterns2Go and PatternsThatFitYou for more easy patterns and projects. Seamstresses and Alterationists – Bring Out Your Scraps! !